The new Harmonia 3 app with a completely redesigned user interface focuses on optimizing user experience and performance. Harmonia 3 allows students to access their homework more easily, and teachers have the ability to maintain collections of media files and embed them into Harmonia documents whenever and wherever they want. As an added benefit, Harmonia 3 will be tablet-ready, meaning students can do homework on their iPads or Android tablets. This short blog post briefly outlines the migration process from Harmonia 2 (H2) to Harmonia 3 (H3). The most important thing to know is that H3 can open H2 files and will convert them to H3 format automatically when they are opened. The reverse is not true: Harmonia 2 cannot open Harmonia 3 files. For this reason -- until summer of 2020 -- teachers can opt to keep an existing Harmonia course in H2 or move it to H3. If the course remains in H2 then students need to use the H2 app to access their course. Similarly, If the course moves to H3 then students will use the H3 app. 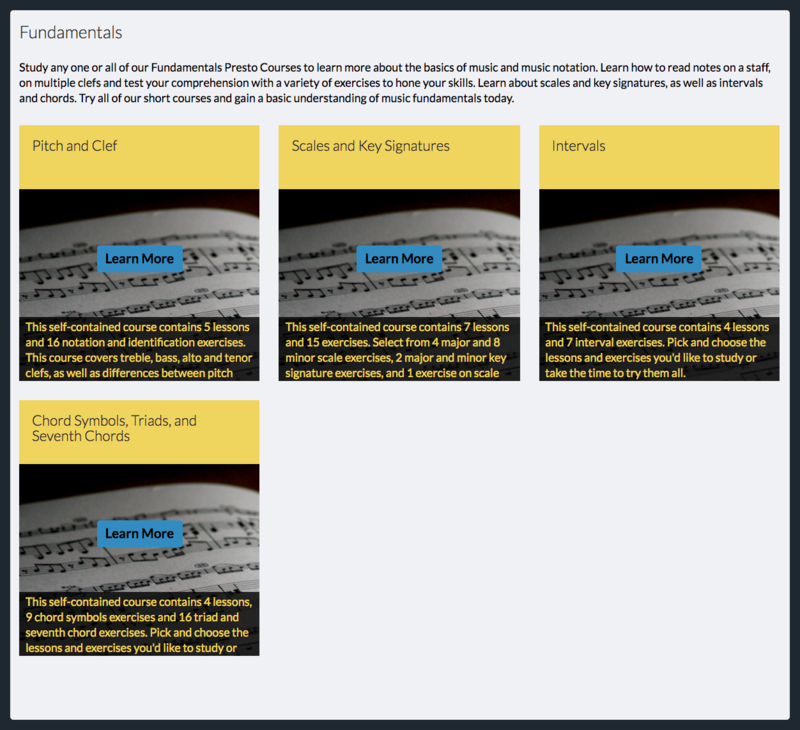 When a teacher creates a new course they will choose which version of Harmonia they want to run the new course in. Given that choice, all the assignment documents in the course will be of the same version (either H2 or H3 files). The Harmonia website will prevent teachers from uploading files that are not the correct version. Note that our free content library will have H3 files ready to be added to H3 courses. When cloning (duplicating) an existing course, teachers can opt to keep the course content in H2 format or they can migrate their materials to H3. The migration process will be described in more detail in an upcoming blog. Once the course has been migrated the Harmonia 2 app will not be able to access a H3 course, and the new Harmonia 3 app cannot access H2 courses either. Downgrading a H3 course to H2 is not supported. The only “incompatible” change between H2 and H3 documents is the fact that Harmonia 3 no longer supports embedding media in files. This change greatly improves cloud transmission rates and keeps file sizes small. In Harmonia 3, all instructional media is streamed to the app in real time, audio from our website or video from Vimeo/YouTube. In a Harmonia 3 course, teachers can create and organize their own audio media collections on our website for free. Once media is uploaded to our server Harmonia3 gives teachers access to their audio links directly inside the app when they create new documents. From the pictures below, you can see how the same assignment is presented in H2 and H3. Before the official release of Harmonia 3 this summer, we will publish detailed step-by-step instructions for migrating your courses from Harmonia 2 to Harmonia 3. And as always, any member of our team is available to answer any questions you may have during the migration process. Stay tuned! Switching to Harmonia-delivered rather than paper-based assignments has many advantages for both teachers and students. One of the most important benefits for students is that homework can be delivered as a series of short targeted assessments, one assessment per document, each of which concentrates on just one concept or skill and contains very few elements to complete. This allows students to concentrate on one concept per document and, more importantly, the grade they receive applies to just that skill. Their homework will also seem to "go faster" because they grade themselves relatively frequently, after completing just a small number of items, rather than waiting to complete several pages of problems. The very rapid grade turnaround also allows students to examine Harmonia's feedback for each exercise quickly without having to first complete numerous items that contain many different sorts of material as paper-based assignments typically feature. Additionally, if you enable multiple submission of assignments, students only have to focus on what they miss, rather than spend time redoing work they did correctly the first time. Option 1: select any page from the Harmonia Content Library (HCL) and add it to your course. 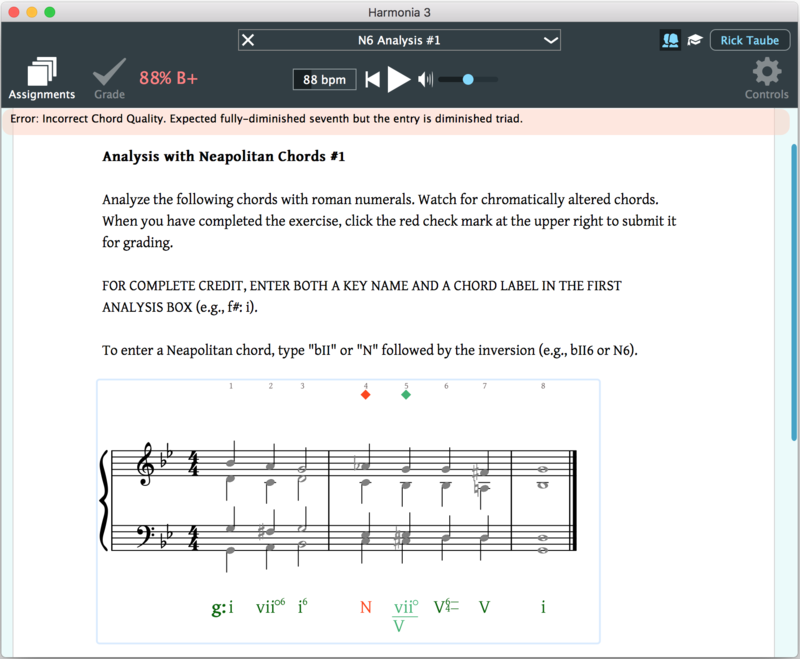 With the exception of chord spelling/identification pages, most HCL files feature only one assessment per page. Group the desired page along with any other pages you’d like students to complete for homework in a single Assignment Set in your course dashboard. 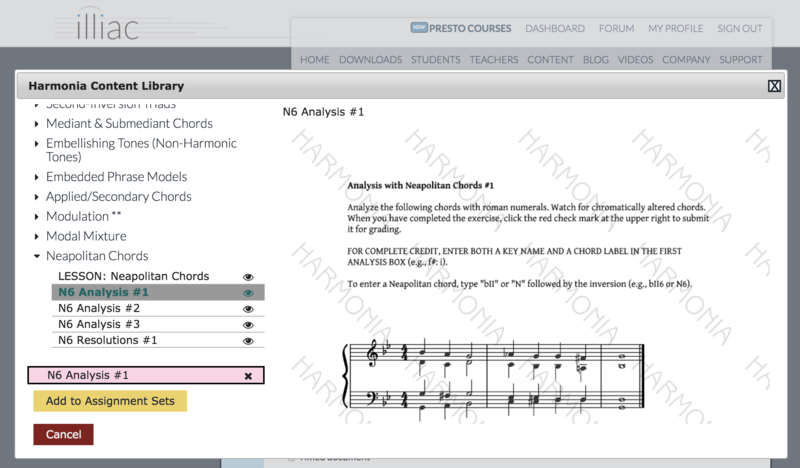 Option 2: create your own assessment using the Harmonia Score Generators or your own content uploaded in Music XML. Add one assessment to a page, a title and some directions, and upload the file to your course dashboard. Check out documentation support pages to learn more about building your own assessment pages. Incremental Grading: students can fill in all or some of an assignment, but Harmonia will only grade what is filled in by students. Allow Multiple Submission: students may complete the assignment as many times as desired before the due date; all attempts are saved and available for review, but the highest grade is recorded in the Harmonia grade book. Delay Showing Grade to Students: if you do not want students to see their grades immediately, such as for testing periods, select this option and fill in the reveal date/time. Override Set Due Date: everything in Assignment Set has the same due date, but you can use this feature to change the date/time for a single file. 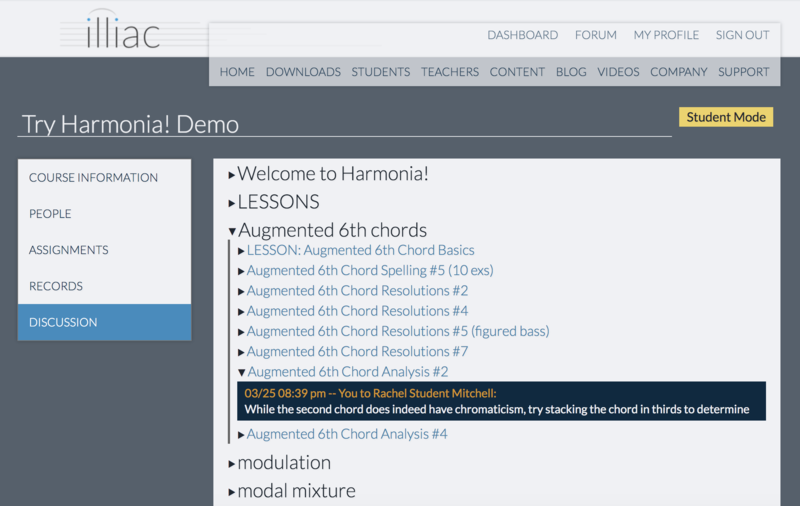 So how do you use Harmonia in your classroom? As the Senior Content Developer for Illiac Software, Inc., I’ve been using Harmonia for years in conjunction with my university learning management system (LMS). I use the university LMS to post homework assignment directions and due dates and I enter grades for completed Assignment Sets in the online gradebook. In Harmonia, I generally create Assignment Sets containing lessons (set to Practice Mode since some contain short “Try Me” assessments) and exercise pages from the Harmonia Content Library, which generally consist of one assessment per page. These part-writing or analysis assessments may include accompanying multiple-choice questions, but each page is relatively short since it will be combined with several other exercises in a set. I configure all assignments to allow for multiple submission so that students may engage with an exercise as many times as desired. Once students complete the Assignment Set, I average together the individual scores of the set and record the grade in my university’s LMS. However, because I want students to keep engaging with the material, such as when preparing for exams, I usually set all due dates in my Harmonia dashboard as the final day of the course. How do you use Harmonia in your classroom? Let us know. We’d like to hear from you. Harmonia is an app used in combination with a proprietary learning management system (LMS). Our free Harmonia app is the combines musical score notation with a patented real-time music analysis engine, which means that as users enter notes on a staff or type in analytical symbols such as pitch names or roman numerals, the app recognizes and comments on what they are doing. Our LMS provides a platform for content delivery: teachers use our LMS to add lessons and exercises, set due dates and content delivery options, review computer-graded student work, and more; and students use the LMS to check their progress, activate our mentoring/comment system, and purchase additional study content if desired. Harmonia does not grant credit. 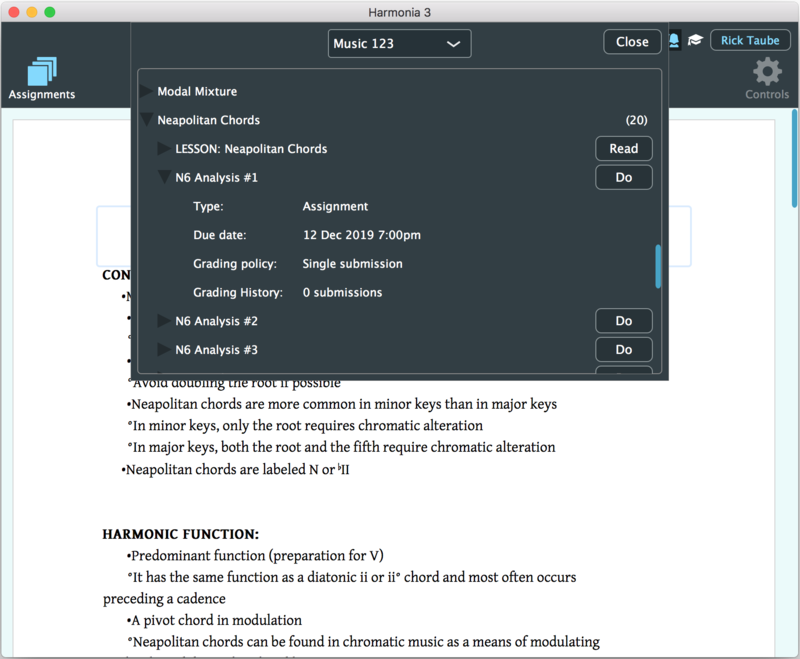 The Harmonia App is simply a music notation editor with a real-time analysis engine and our Harmonia Dashboard is a learning management system similar to Blackboard or Canvas. Our App and Dashboard link together to offer teachers and students a better music theory experience. Content is delivered through the Harmonia Dashboard; practice and feedback is completed and received through the Harmonia App. In-app grading schemes may be edited to fit instructor needs, and student submissions and grades are stored on our secure server. Teachers can view student data in our Harmonia Dashboard and download grades in a csv file, which may be uploaded into any other learning management systems such as Blackboard or Canvas. Will Harmonia work on my computer? Harmonia will work on all Mac OSX and Windows machines. Contact our developers if you have any questions. What is a Harmonia subscription? The Harmonia App is free for all users and available for Mac and PC here. Access to the Harmonia Dashboard, our proprietary learning management system, is free for teachers and subscription-based for students. Pricing is related to the number of weeks a student pays for access. A typical 16-week semester is $29.95, but quarters and summer courses may be less. See our pricing chart above. Yes. We offer both site licenses and single-user licenses. Most of our high school customers pay by site licenses. Contact us at contact@illiacsoftware.com to get started. Step 1: Request a teacher account. To request a teacher account, click the “Sign Up” link. Confirm your email address and set your password. Click the “request teacher account” when setting your account information and password. Step 2: Download and open the Harmonia App. To download the latest version of the app, click on the “Downloads" link at the top of the window and select the correct version of the app for your machine. Follow the directions for your computer to complete the download process. (Be sure to delete any old versions of Harmonia from your Applications folder before downloading the latest version.) Once you have downloaded the app, open it and click on the cloud icon on the upper left corner of the window. Enter your email address and password. Then select “Cloud" from the menu options at the top of your screen to access the course. Find your course and navigate to the bottom of the list to find the “Welcome to Harmonia” file. Open it and check out the quick Harmonia tutorial. Step 3: Log in to the Harmonia website using your teacher account. (If you do not have a teacher account, click here. Only users with teacher accounts are able to create courses.) Once logged in, click on “Dashboard” at the top of the window. This will take you to your course pages. To create a course, click the gold “Create a new Harmonia Couse” button. This will take you to a new screen. Fill out the required information and click the yellow “Create New Course” button at the bottom of the screen. Note: Course Start and End Dates are the dates that your students will be granted access to materials in a Harmonia course. These dates are usually defined by your school as the first and last days of the semester, including examination days, if required. Keep in mind that instructors may work on a course long in advance and add materials before a course begins (and also revisit a course once it has been completed), but students will be charged according to the number of weeks the course materials are available to them. The Free Access End Date simply gives students a two-week period of free access to a course before they will be denied access for non-payment. This period enables students to log in, download the app, navigate the Harmonia Dashboard, and submit a few exercises. However, if a student decides to drop the course or move to a new course section, they will not be charged. Step 4: Once you click “Create New Course,” our development team will verify your credentials, and our server will generate a course shell will a unique 16-digit course code, which you will receive via email. Students will use the code to join the course to access course materials. Step 5: Once students enter the invitation code, our server will send you an email asking you to invite them to join the course. Follow the link in the email to permanently add the students to your course. (This instructor verification system ensures that your students join the correct course.) The next time students log in to the Harmonia website, they will be prompted to pay their subscription online. Our secure website accepts credit card and PayPal. Feel free to edit the attached instruction sheet for distribution to your students. You can add any manner of .har files to a Harmonia course. 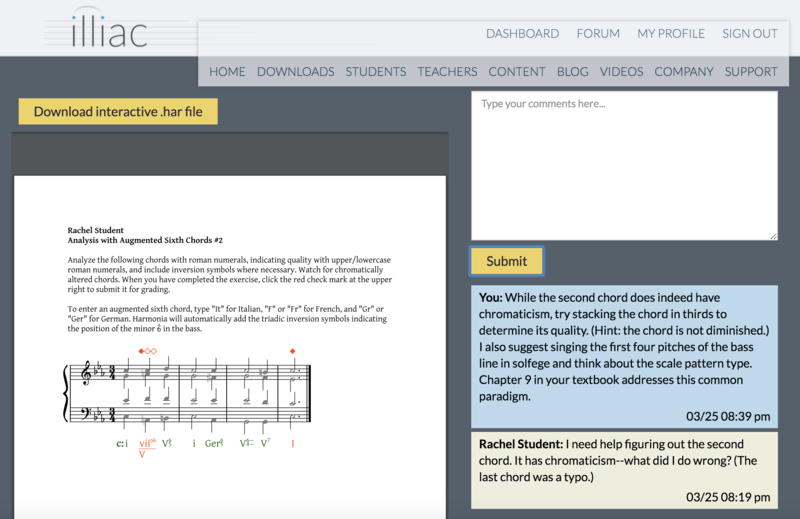 Create lessons, practice exercises, exam questions, multiple choice questions, and more. With a teacher account, you also have access to hundreds of ready-made documents in the Harmonia Content Library. To view materials in the Harmonia Content Library, log in with your teacher account and click on the Content tab at the top of the page. Scroll through the table of contents on the left and click on the triangles to expand each topic. Click on a file to preview it on the left. 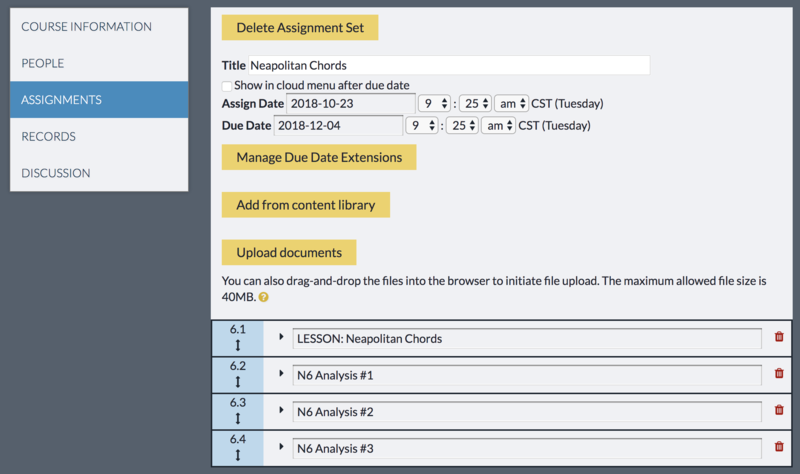 To add a document to your course page, select your course in the Harmonia Dashboard, select “Assignments” in the left column, and click on the gold “Add Assignment Set” button. A Harmonia Content Library window will open, and from there, you can click on the files of your choice and add them to your course. Clicking on the eye icon will display a preview of the file. Keep in mind that Harmonia files will become interactive once opened in the Harmonia app. For example, in the document above, the rests will become editable note heads for students to drag around on the staff. Selecting a file will highlight it pink, which can be added to your course’s assignment sets once you click the yellow “Add to Assignment Sets” button. Once added to your course, you may edit the document titles, set document details, or delete unwanted files. If you would like to edit a document (such as text, multiple-choice questions, images, and complete music scores), click the download button, open the file, make changes, and then re-upload the document to the assignment set by selecting the yellow “Upload documents” button near the top of the window. Once material has been added to your course, a student may access it by logging into Harmonia and finding the document in the Harmonia Cloud menu. To create a Harmonia (.har) document from scratch, visit our support pages. Why are my students locked out of the Harmonia Cloud? If your students are locked out of the Harmonia Cloud while in the app, it is because the subscription to access the course materials has not been received. Remind them to log in to the website, click on the dashboard and follow the payment instructions. Once received, they can return to the app and log out and log back in to reset their login credentials. How do I find grades and student submissions? 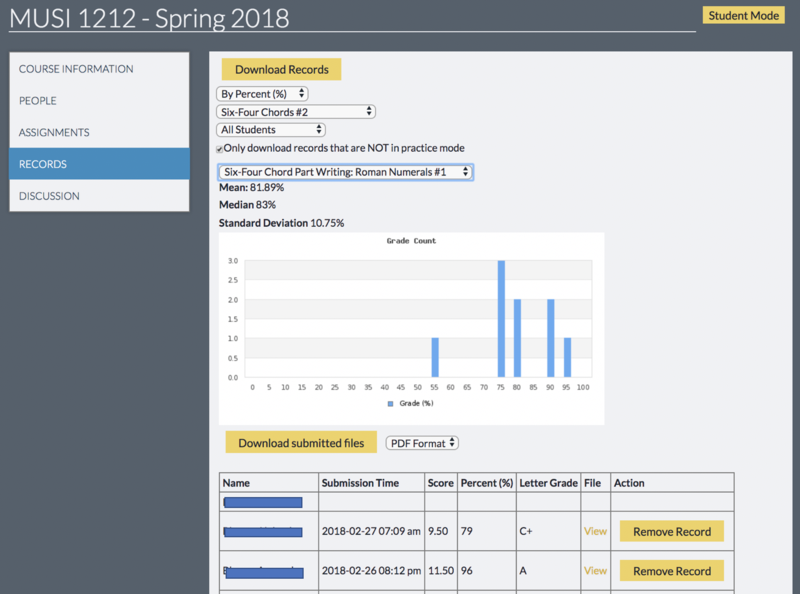 In the Harmonia Dashboard, click on your course and select “Records.” Teachers can customize the view to show all students, a single student, all assignments, a complete assignment set, or a single assignment. Use the pulldown menus to customize the desired view and click the click the gold “Download Records” button to generate a .csv file which may be edited or uploaded into a different LMS. Note that grade distribution statistics are provided in the “All Students” view. To view individual student submissions, select either the student view or the single-assignment class view and click on the yellow “View” link under the File column. Document exercises set to single submission will show a student’s submitted file. Document exercises set for multiple submission may have a pulldown menu with multiple student submissions. View each submission in the Dashboard window or download an interactive .har file, which may be opened in Harmonia. My students need more help. 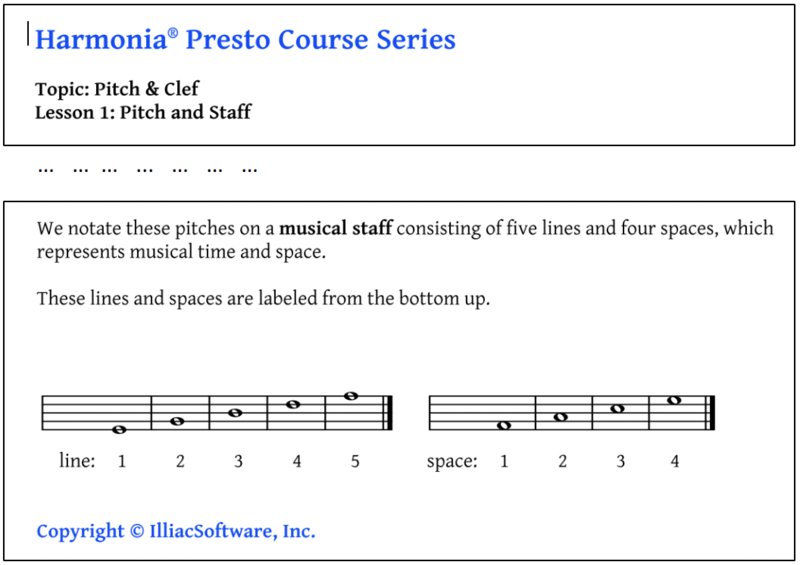 What are Harmonia Presto Courses? Presto Courses are individual study courses packaged by topic. For example, we offer miniature courses in fundamentals topics, diatonic, and chromatic harmonies. Each Presto course offers interactive lessons, identification, spelling, and part writing exercises, where appropriate. Read more about our Presto courses in our upcoming blog. Yes. We offer both site licenses and single-user licenses. Most of our high school customers pay by site licenses. Contact us by email at contact@illiacsoftware.com to get started. Access to the Harmonia Dashboard is a subscription-based service, so pricing is related to the number of weeks a student pays for access. A typical 16-week semester is $29.95, but quarters and summer courses may be less. See our pricing chart at https://harmonia.illiacsoftware.com/pricing for more information. Step 1: To join a Harmonia course, you will need to create an Illiac Software account. Visit https://harmonia.illiacsoftware.com and click the "Sign Up" button at the upper right and enter your school email address (or current email address). You will receive an automated email message from our server with directions for creating an account. Create your profile by entering your name, selecting the correct time zone, and choosing a language preference. If you already have an account, simply log in using your Illiac ID. Step 2: Add your course. Once you create an account, select “Dashboard" from the menu at the top of the window, click the “join the course now” link and enter the 16-digit invitation code assigned by your instructor to access your demo materials. This code will send a message to your instructors, who will enroll you in the course. Please allow up to 24 hours to be added to a course. The next time you sign in to your course on the Harmonia web page, it will prompt you to pay your subscription fee. Click on the link and follow the payment instructions. Step 4: Get started! Once you have downloaded the app, open it and click on the cloud icon on the upper left corner of the window. Enter your email address and password. Then select “Cloud" from the menu options at the top of your screen to access the course. 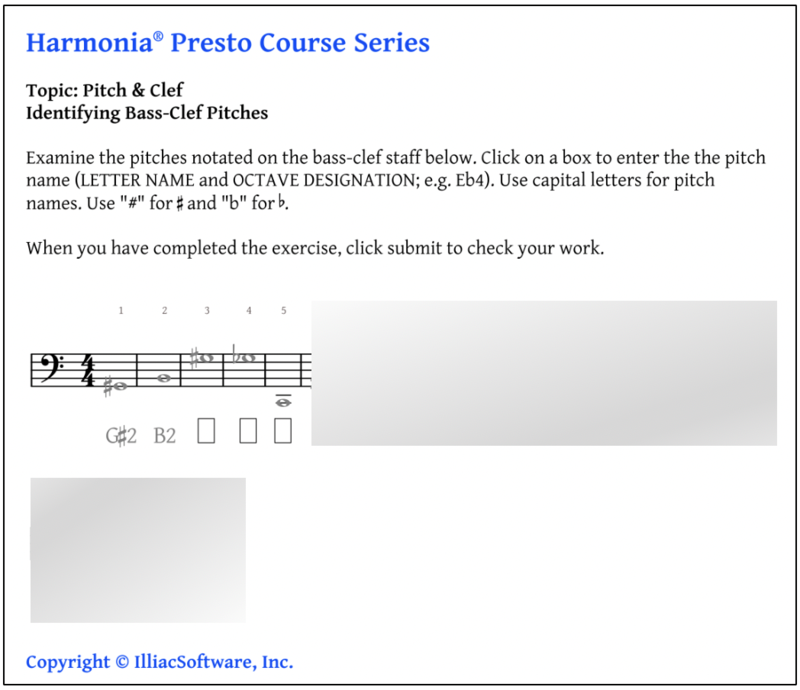 Find your course and navigate to the bottom of the list to find the “Welcome to Harmonia” file. Open it and check out the quick Harmonia tutorial. Why am I locked out of the Harmonia Cloud? If you find yourself locked out of the Harmonia Cloud while in the app, it is because the subscription to access the course materials has not been received. Log in to the website, click on the dashboard and follow the payment instructions. Go back to the app, log out and log back in to reset your login credentials. How do I find my grades and submitted work? In the Harmonia Dashboard, click on your course and select “Assignment Status.” Scroll through your submitted assignments to view your grades. To view Harmonia-generated feedback, click “View” to open a single annotated and graded submission. If enabled by your instructor, view previous attempts by clicking on the pull down menu above your annotated page. I need more theory help then what I get in my course. What can I do? Presto Courses are new, individual-topic study courses available over the course of Fall 2018. For example, we offer Presto courses in topics related to fundamentals, diatonic harmony / part writing, and chromatic harmony / part writing. Each Presto course offers focussed interactive lessons and exercises in identification, spelling, and part writing, where appropriate. 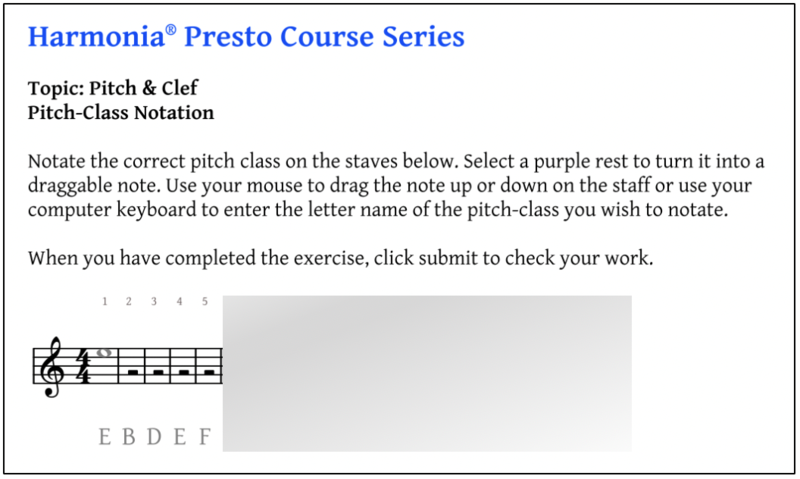 Like other Harmonia courses, course grading is automatically by Harmonia so the student can immediately see what the know and what still needs to reviewed or practiced.. Read more about our Presto courses in our upcoming blog! Did you know that Harmonia offers students and teachers an online discussion and comment board? Our discussion board facilitates the learning process between teacher and student by offering students an easy way to post comments and ask questions right from our website. Students often have questions while reading theory lessons or completing homework exercises. In such cases, students can log in to the Harmonia website, ask a question, and await a response. All comments and responses are logged and attached to specific assignments for easy reference. 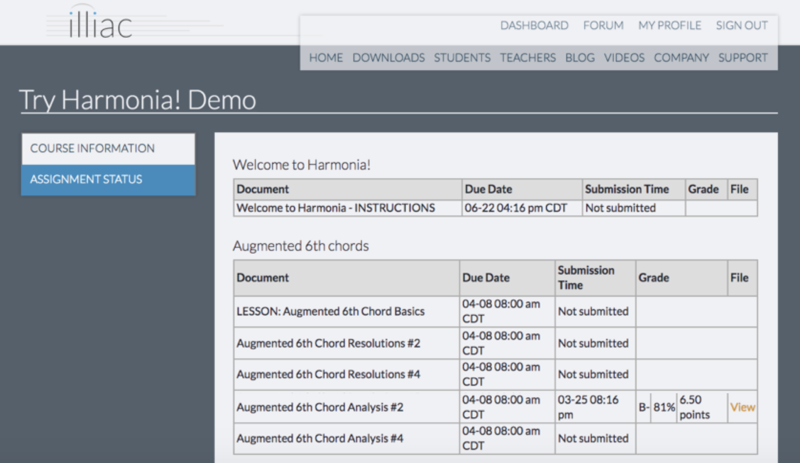 Step 1: In the Harmonia app, complete and submit an assignment. If you have a question or a comment about the assignment, proceed to Step 2. Step 2: Log in to the to the Harmonia website. Find your course in the Dashboard and locate your submitted assignment under the Assignment Status tab. Click "View" to see your submission. Step 3: In the comment box to the right, type and submit your comment. The Harmonia Server will send an email message to the course instructor, which prompts him/her to respond in the same website portal. Step 4a: Following the link provided in the Harmonia Server email alert, an instructor may log in to the Harmonia website, answer the student question in the text box on the right as seen above, prompting another automated email response, this time to the student. Students may likewise find comments from teachers under the "Assignment Status" tab in the course Dashboard. Step 4b: Instructors may also respond to comments by clicking on the "Discussion" tab in the course menu. The assignment set and specific assignment will be highlighted for easy visibility. Students and teachers may submit multiple comments for a single assignment and all comments attached to an assignment are logged and saved for future reference. It should be noted that comments do not automatically update on the Harmonia website. Users will need to manually refresh the website to view new comments in real time. Harmonia's Discussion & Comment feature provides students an easy system for posting questions about their homework or theory lecture. 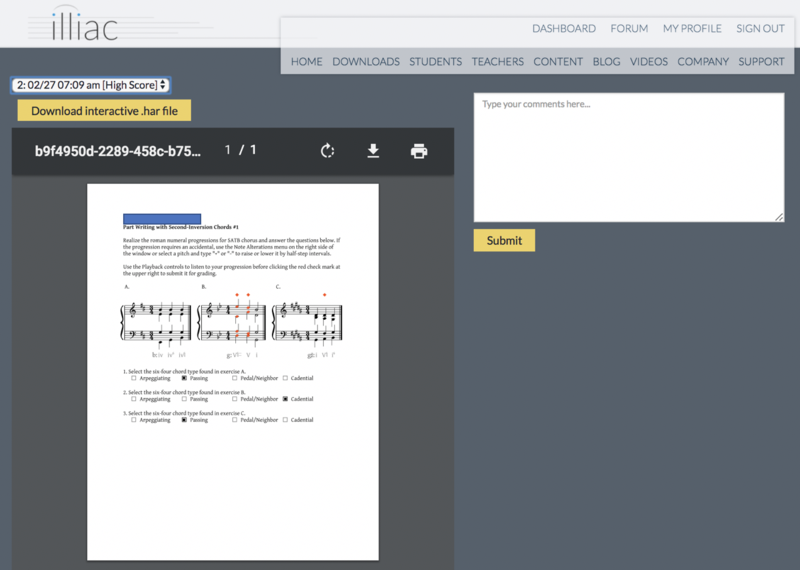 Whether you are teaching or learning music theory in a traditional classroom, in a flipped classroom model, or in an online course environment, Harmonia's comment system may be a helpful tool for you. Try it in your course and let us know what you think. We always like to hear from you since your comments help us make Harmonia a better product for you. How did the Harmonia music theory app start? The idea for Harmonia came to me in 1997, just two years after I joined the composition/theory faculty at the University of Illinois. At UIUC all composers teach theory, and as the newest faculty member I was assigned to teach first-semester theory and aural skills. While I had taught similar courses in the past, during the preceding decade I had actually been working outside academia, as a computer researcher, first at the Price-Waterhouse Technology Centre in Menlo Park, CA and then for five years at the Zentrum für Kunst und Medientechnologie in Karlsruhe, Germany. What struck me most about teaching theory again was that — though the content I was teaching had changed very little — the circumstances in which I was teaching was very different than anything I had previously experienced. I firmly believe that the best way to learn music theory concepts is to study how they are used in real compositions and to compose music that demonstrates those concepts. To do this, it is important that a student receives fast instructional “feedback” from teachers to complete a learning cycle. I was taught harmony and voice leading by Prof. Herbert Nanney, organist at Stanford University, who lectured to his (small) class sitting at the piano, where he would play, improvise and work with us “in real time” to improve our exercises. My Music 101, in comparison, took place in a large classroom and had about 90 students with widely varying degrees of theory knowledge and skills. I had eager TAs, but their theory experiences were also quite varied. In my class, I found it was simply not possible to provide each individual student enough "learning cycles" to really master concepts and remediate problems. Since hiring more teachers or limiting student enrollment was not an option, I realized that the best way to address these issues was to adopt a technology that could provide unlimited access to practicing analysis and composition with instructional feedback, thus breaking the linkage between class sizes and the amount of learning cycles that can take place. Moreover, unlimited guided practice would help every student learn, regardless of class size. Since I have strong programming skills I began working on developing music software that could analyze real music and relate the issues it discovers back to a user in detail. Progress was steady but also slow as research grants for faculty in the fine arts were hard to come by and did not involve large sums of money. The game changer came for us in 2015, when the National Science Foundation awarded Illiac Software a $264,000 STTR "proof of concept" grant. With that grant we were able to complete a prototype, embed it in an actual course and prove that computer analytics can indeed be used to improve students learning outcomes over the status quo. It also facilitated a number of other beneficial features such as integrated multimedia and cloud-based course delivery! Our NSF grant took us through the end of 2016, and we started officially commercializing in January 2017. Our primary goal as a company is to improve theory education for all students at a fraction of the cost of what what would otherwise be possible. While we are really just at the start of this journey, I am excited and heartened by the feedback we have had from professors and students alike, and we have many plans and ideas to improve our application and course management system as we move forward.